Think of everything you love about donuts, everything you love about croissants, and then how pretty much anything tastes better fried. 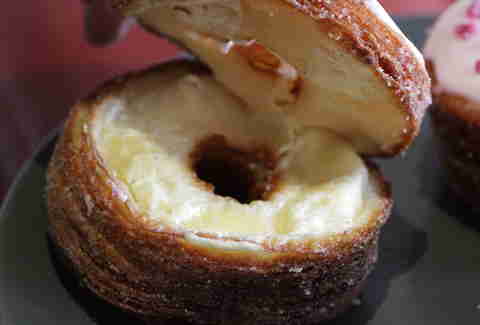 Now imagine what it'd be like if some mad genius were to create a fried croissant-donut hybrid -- a cronut, if you will. (And you definitely will.) 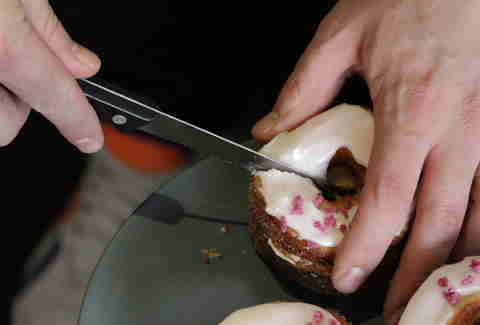 Now stop imagining and head to NY's Dominique Ansel Bakery, where real-life cronuts are being made right this very second. And this second. And this second. For the moment, you'll have to line up bright and early for these bad boys -- they've been selling out within minutes the first few days they've been on the market. 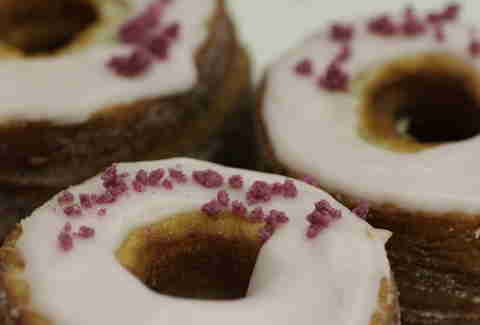 But we taste-tested them, and you can rest assured that the icing-topped, flakey, sweet, cream-filled treats definitely "back up the hype" and are "holy sh*t good". 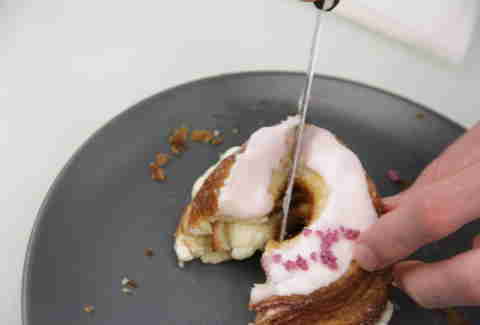 Check out the photos and what our cronut-testers had to say, and be jealous that you're not wiping parts of one off your face right now: If you are unfortunate like us and need to share, you basically HAVE to use a serrated knife to cut it up, so it doesn't fall apart layer-by-delicate-layer. Even though that will likely still happen a bit. "They're like the best Pillsbury layer biscuits that your mom makes on Thanksgiving ever." "This is it. This is the future." "I don't get as much croissant as I do zeppole, eclair, and donut." "It's leaking. Oh my god. I wasn't expecting a cream filling." "They should make them cake-sized." "Oooo I would do that for my wedding… and just not tell my fiancé. 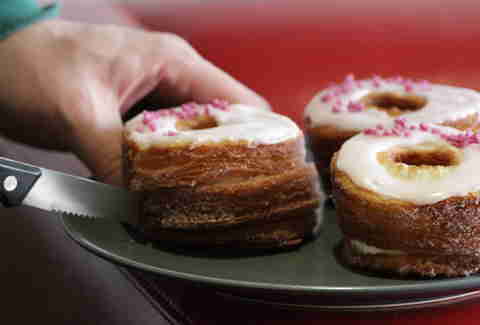 Just have a giant uncuttable cronut." "Split it open and make it cream." 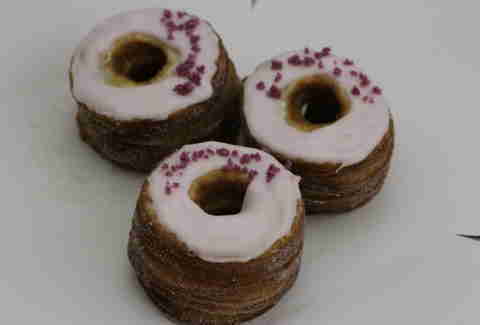 "I can't wait for a single malt Scotch cronut." 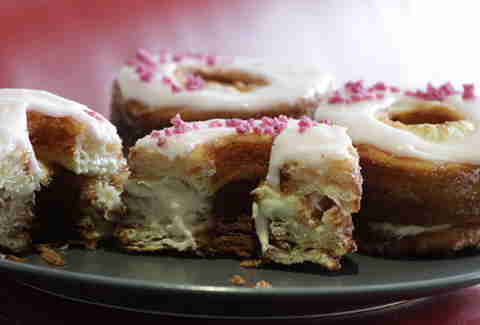 "I regret nothing other than not having my own cronut." "My only regret is not eating all three." 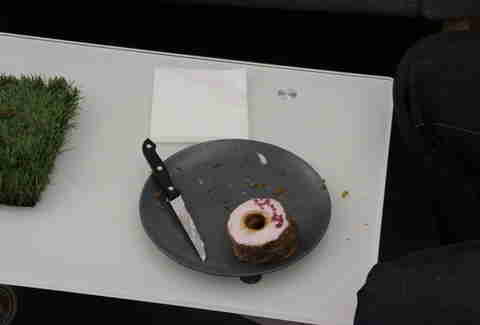 "He died as he lived, eating a cronut." You're gonna want to lick any latent cream off the plate when you're done, and that's just fine. Also worth noting: DAB's planning on rolling out a new flavor every month, so even though rose/vanilla is what's happening right now, they're working up flavors like dulce de leche, maple lemon, and something booze-inspired, which is another thing people tend to think about liking quite a bit. 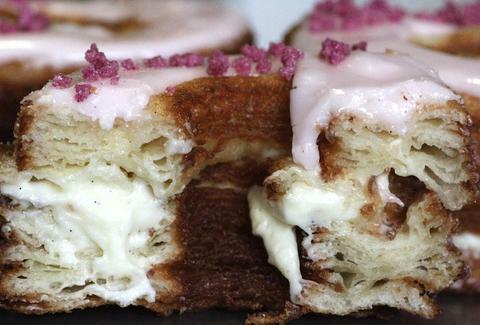 Can't get enough of these tasty croissant/donut hybrids? 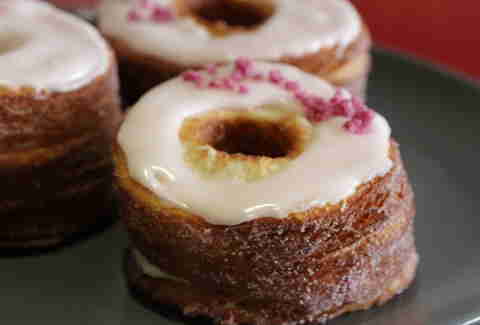 Check out all the Cronut knock-offs around the world on our interactive Cronut (and Cronut impostor) map!